What is the Best Car Ramp for Large Dogs? Your cute and cuddly 85lb dog can no longer get into your vehicle on his own, and you’ve realised it’s time to shop for a car ramp for large dogs. Where to begin! It all begins here, where we’re going to be looking at some of the best-sellers to help you make the best decision for everyone. There are a number of things to consider before actually making a purchase – some you can find out right now, others you won’t know until you see your options. Below is a list of all your considerations. Right away the things that struck me about the WeatherTech pet ramp were the facts it was made in USA and only weighs 16lbs!! It couldn’t be simpler to operate this ramp, all you have to do is unfold it, rest it against the car and let your dog walk up. The rubber feet at both ends helps keep the ramp in place, and the anti-skid traction on the surface means your dog won’t slip while walking up and down. The handles make it easy to carry, so moving it to store or lifting in and out of the car isn’t too difficult. It may not weigh very much but its sturdy construction has been designed to handle pets up to 300lbs! When unfolded it is 67” long and 15” wide, and folded it is 33.5” long. These measurements will help you judge the steepness of the incline against your car and whether or not you have room to store it in your vehicle. Easy to clean, it won’t rust or corrode what’s not to love! Buyers were very happy with the sturdiness and stability of this ramp, and liked the added bonus of a ledge on the side to prevent their pups from falling. As a result it was rated 4.9/5. Sounds like a great car ramp for large dogs don’t you think!! Another style to consider is the Solvit telescoping pet ramp, which extends rather than folds. This extra long version extends from 47” to 87”, is 20” wide and 4” high. The benefit of the extra length means a more gradual incline, making it easier for a dog with mobility issues to walk up. Too steep and it could be too painful to use. Weighing 18lbs it can support 300lbs of animal weight, and the surface is textured to prevent slipping. Raised side rails helps your dog feel more secure, so even if he stumbles it should prevent him from falling off the side. Rubber feet keeps it stable when in use, and when you’re done slide it back into place, use the safety latch to keep it closed and pick it up by the handle to put back in the car. So easy to clean with a mild detergent or just turn the hose on it! Over 1100 users offered their reviews of this Solvit telescoping pet ramp, and overall they loved the quality, ease of use, and most importantly how much it helped them and their dogs. They rated it 4.2/5. Too big to store in a “standard” car. A very valid point but that’s why it’s important to know your car’s measurements and those of the ramp you’re interested in, before buying. This is a great ramp for those that need the extra length to create a more gradual incline. If your dog doesn’t react well to the surface texture as many haven’t, putting rubber mats or towels on top seems to have made a difference. What could be easier to use than a ramp that you unfold, prop against your car (the rubber grips keep it in place), and your dog walks up or down? The PetStep original folding pet ramp is it! Weighing 18.5lbs, it holds up to 500lbs of animal weight which is absolutely amazing. Only something super sturdy can hold that kind of weight without sagging, and that’s due to the advanced composite plastic construction. Unlike other ramps that use abrasive non slip materials, this ramp has a rubberized walking surface so it’s comfortable on your dog’s paws. It also means no materials like carpet or tape that can trap odors, and it’s super easy to clean with soap and water. It opens and closes in seconds, folds in half for easy storage and the molded ergonomic handles on both sides makes lifting it to put in your car a breeze. It also comes with a 5 year warranty. They’re loving the quality and ease of use, and a big selling feature for a lot of users is the rubberized surface. Many have tried other ramps with a rougher surface and their dogs cut their paws or were reluctant to use it because they weren’t comfortable with the texture. One woman who rescues giant breeds loved the stability and quality of this ramp over a metal extendable one she previously had, and her ramp really gets a workout!! 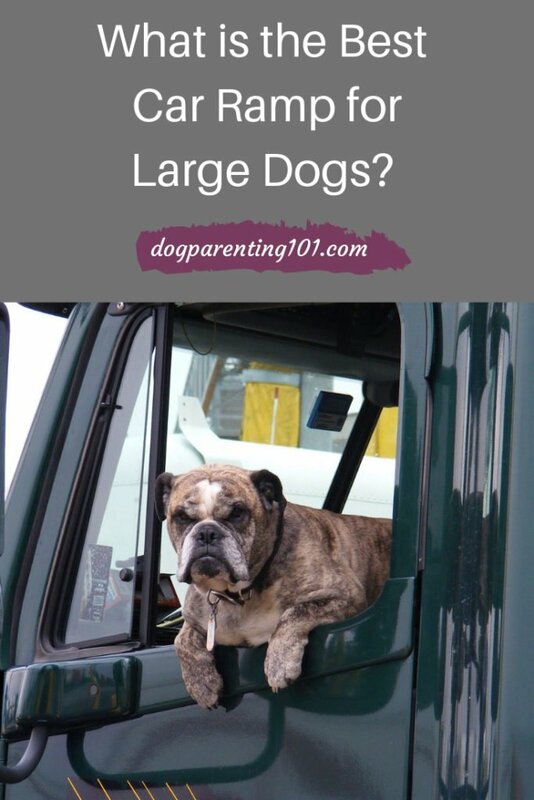 So, what is the best car ramp for large dogs? 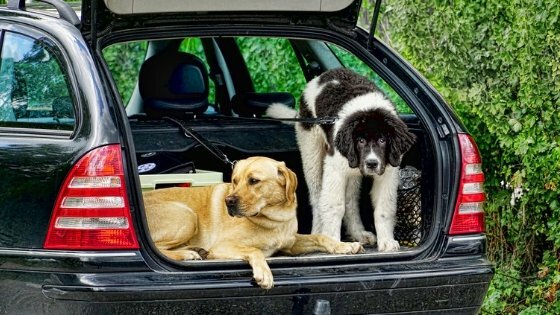 The best car ramp for a large dog is the one that benefits you the most, and naturally that will differ from person to person. 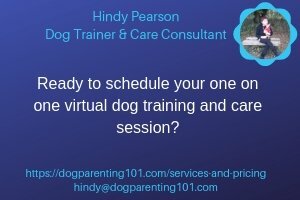 The 3 mentioned here are all solid choices, and whether you choose this one or find another you prefer, will ultimately depend on how well it will suit your needs and the needs of your dog. For example, I know my dog is funny about the textures he walks on so a rubber surface would suit him better. I’m not a particularly strong person so while the weight of the ramp would be a consideration, if it’s only a matter of sliding it into the car I don’t think it’s a make or break factor. I don’t drive a truck or an SUV so size is extremely important in terms of room in the vehicle. Do any of these ramps sound like a good fit? What makes that one a possibility over the others? Have you ever had a ramp before and if yes, what kind of a difference did it make? Sharing helps others so please leave a comment below.